Congratulations! 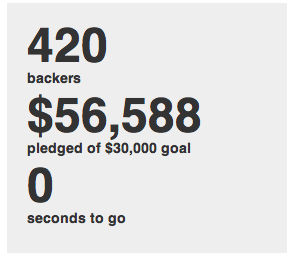 Your Journalism Kickstarter Was Funded! Here’s my first tip: Don’t build an app. I’m not saying *never* build an app. Just not right now. It’s not (most likely) what you are good at. It’s not (most likely) why your friends and followers supported your journalism project. Focus on the things you are good at, like creating great stories. It’s probably pretty obvious, but this is just one quick thought related to a larger existential Kickstarter angst I’ve been working through lately, especially when it comes to journalism-related projects. Do I keep spending my money to support them? Should I be encouraging this approach, when I know that it is a very painful road? Crowdfunding is a powerful tool for getting a little bit of cash to make something happen. But it is not a revenue model. And what I hear from publishers who successfully raised $50,000 (or more) on Kickstarter is this: The money does not last long. If you squander all of your supporters’ money on app development, I’m sorry, but you are no longer a Journalism Kickstarter Project. Put the writers and the editors first, and pay them.